Immaculately restored miners cottage with the comforts of home. 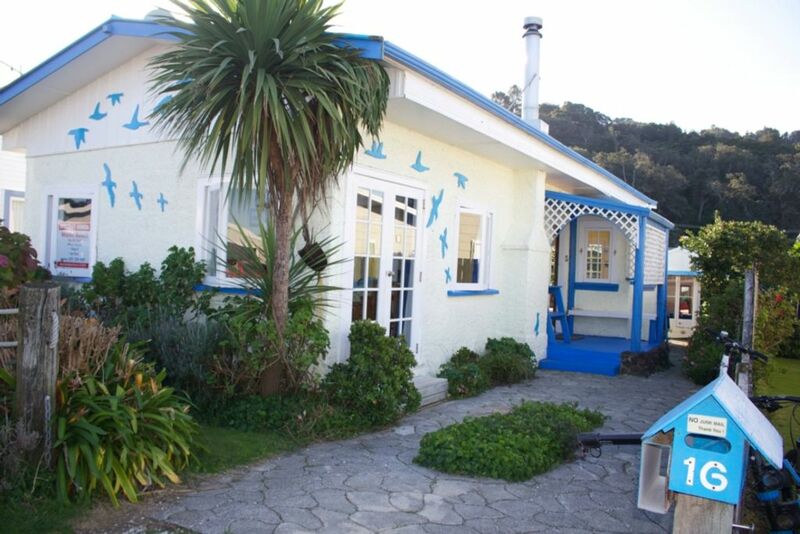 The seagulls fly around and the Tuis feed on the Kowhais and Pohutakawas. The huge back deck is ideal for relaxing or entertaining. Pitch the tent, play cricket, park the boat off street and get into action. Close to the new tennis courts and walks along the coast. Such a safe beach and yet cafes and restaurants handy. Set up for families with kids retreat, sleep out and a sheltered sunny location all day. No linen provided.Please provide you own. Open fire , fully insulated cosy in winter. Fantastic classic kiwi bach! So close to the beach and dairy for last minute bits and pieces you need. The sun streams on to the deck with ample seating to enjoy the outdoors. We were there multi days and during a rainy weekend so the indoor fire was a saviour at night. We had enough time to play with the board games and finish off a puzzle before leaving. Great location - our son loved scoping his surf spot from the bedroom window in the mornings. Clean & tidy. We will definitely be booking again. Quaint, old charm, clean and tidy. Quaint, old charm, clean and tidy. Comfortable lounge. Shower pressure appalling. Good accommodation for family group. Very handy location. Fantastic location, right near the beach. Fantastic location, right near the beach. Beautiful deck, nice for relaxing during the day. We loved the birds decorating the outside of the house - made it stand out and gave it a beachy feel. Living area was nice and cosy. Bathroom set-up worked out well for sharing between 8 girls. Nice that the toilet, shower and sink could be used at the same time. Consumables such as toilet paper, dishwashing liquid etc. all provided which we weren't expecting. All in all a wonderful stay! We enjoyed being so close to the north end beach,. We enjoyed being so close to the north end beach,. The back patio provides a good outdoor area with protection from the weather at any angle if needed. A classic bach which reminds you of a time when life was a lot slower.